We then who are strong ought to bear with the scruples of the weak, and not to please ourselves. Let each of us please his neighbor for his good, leading to edification. For even Christ did not please Himself; but as it is written, “The reproaches of those who reproached You fell on Me.” For whatever things were written before were written for our learning, that we through the patience and comfort of the Scriptures might have hope (Rom 15.1–4). Rather than pleasing ourselves, we please our neighbor. This is the example Jesus set, fulfilling Psalm 69.9, and by that Paul meant we are to follow the teaching of Psalm 69. Then that launched him into the thought that whatever was written before—not only Psalm 69.9, but all the Old Testament—was written for our learning. It was written and preserved for Christians. I know that contradicts what most people and preachers say, but the Holy Spirit says learn from the Books of Genesis through Malachi. Paul wrote of two things we learn from the Scriptures, patience and comfort, which in turn give us hope. Let us then learn something from Deuteronomy 27–30. First, Moses and the elders commanded Israel to obey the commandments of God, and to build an altar on Mount Ebal, whitewash the stones, not cutting or shaping the stones, and write on them the Law of God. 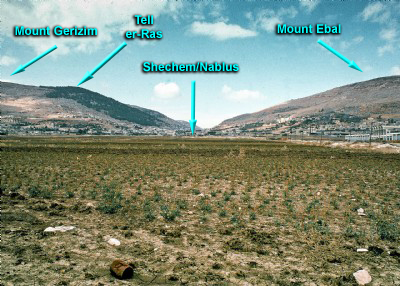 We have discovered this altar on Mount Ebal, and we know the location of where Israel gathered between Mount Ebal and Mount Gerizim. They needed a reminder of why they were in the land, that the Lord was keeping His promise made to their fathers. Therefore, right in the geographic middle of the land itself, they could go to this location, read the Law, and know that God keeps His promises, even if it was a promise made to someone hundreds of years before. Not everyone had a copy of the Law. They were the generation that first received the Law, and it would take much time, work, and money to reproduce the Law for others to possess. Let us be grateful to God that we can get copies of the Scriptures easily now, and in any form we desire. Then Moses and the priests, the Levites, spoke to all Israel, saying, “Take heed and listen, O Israel: This day you have become the people of the Lord your God. Therefore you shall obey the voice of the Lord your God, and observe His commandments and His statutes which I command you today” (Deu 27.9, 10). How could it have been said that they were His people, if they did not obey Him? A people obeys and pleases its God. Jesus used this reasoning in Luke 6, “Why do you call Me ‘Lord, Lord,’ and not do the things which I say?” (Luke 6.46). Can others say of us that we carefully obey all the will of our Lord? “Now it shall come to pass, if you diligently obey the voice of the Lord your God, to observe carefully all His commandments which I command you today, that the Lord your God will set you high above all nations of the earth. And all these blessings shall come upon you and overtake you, because you obey the voice of the Lord your God: ‘Blessed shall you be…” (Deu 28.1–14). “But it shall come to pass, if you do not obey the voice of the Lord your God, to observe carefully all His commandments and His statutes which I command you today, that all these curses will come upon you and overtake you: ‘Cursed shall you be…” (Deu 28.15–68). If they disobeyed the Lord, curses would come upon them and overtake them. When I read both the blessings and the curses, both remind me of America. You see, God still blesses nations for their righteousness and curses nations for their wickedness. I urge you in the strongest way to read Deuteronomy 28 as though it speaks of us, or your nation, because you will see that America and the church have experienced the blessings, but you will see that America and the church have started to experience the curses. Then remind yourself of why we have experienced blessings and why we have started to experience the curses. It makes my soul tremble to see what may be coming. Now Moses called all Israel and said to them: “You have seen all that the Lord did before your eyes in the land of Egypt, to Pharaoh and to all his servants and to all his land—the great trials which your eyes have seen, the signs, and those great wonders. Yet the Lord has not given you a heart to perceive and eyes to see and ears to hear, to this very day” (Deu 29.1–4). Then he went on to show how they saw with the eyes of the body, but not with the eyes of the spirit, for the Lord not only did wonderful things to bring Israel out of Egypt, He also did wonderful things for them in the wilderness and they did not realize what the Lord was doing for them. It did not register with them that they should have been loyal to Him, that they should have obeyed Him, and that they never should have credited idols. The Lord told Isaiah the same thing about his generation (Isa 6.9, 10). The Lord accused Ezekiel’s generation of the same problem (Eze 12.2). Jesus quoted Isaiah, charging the first century with this sin (Matt 13.14). Paul quoted Isaiah, showing the problem persisted (Acts 28.26, 27). Paul used both Isaiah 6 and Deuteronomy 29 in Romans 11.8. Paul accused the entire Gentile world with spiritual blindness (Eph 4.18). At verse 9, Moses urged them to keep the covenant, and the Lord would prosper them. Moreover, in verse 13, Moses said, “…that He may establish you today as a people for Himself, and that He may be God to you…” (Deu 29.13). This constitutes part of The Family Promise of God, which we find throughout the Bible, so that Christians now partake of what verse 13 says. It culminates in Revelation 21.3. The Lord has also made a covenant with us. We see that Jesus died for us, but does it register with us that we should be loyal to Him, that we should obey Him, and that we should never credit anything other than God for our blessings? “Now it shall come to pass, when all these things come upon you, the blessing and the curse which I have set before you, and you call them to mind among all the nations where the Lord your God drives you, and you return to the Lord your God and obey His voice, according to all that I command you today, you and your children, with all your heart and with all your soul, that the Lord your God will bring you back from captivity, and have compassion on you, and gather you again from all the nations where the Lord your God has scattered you” (Deu 30.1–3). “And the Lord your God will circumcise your heart and the heart of your descendants, to love the Lord your God with all your heart and with all your soul, that you may live” (Deu 30.6). In Him you were also circumcised with the circumcision made without hands, by putting off the body of the sins of the flesh, by the circumcision of Christ, buried with Him in baptism, in which you also were raised with Him through faith in the working of God, who raised Him from the dead (Col 2.11, 12). He cuts away the sin from our hearts at baptism that we, like the Israelites, might love Him with all our hearts. “For this commandment which I command you today is not too mysterious for you, nor is it far off. It is not in heaven, that you should say, ‘Who will ascend into heaven for us and bring it to us, that we may hear it and do it?’ Nor is it beyond the sea, that you should say, ‘Who will go over the sea for us and bring it to us, that we may hear it and do it?’ But the word is very near you, in your mouth and in your heart, that you may do it” (Deu 30.11–14). For Christ is the end of the law for righteousness to everyone who believes. For Moses writes about the righteousness which is of the law, “The man who does those things shall live by them.” But the righteousness of faith speaks in this way, “Do not say in your heart, ‘Who will ascend into heaven?’ (that is, to bring Christ down from above) or, ‘Who will descend into the abyss?’” (that is, to bring Christ up from the dead). But what does it say? “The word is near you, in your mouth and in your heart” (that is, the word of faith which we preach): that if you confess with your mouth the Lord Jesus and believe in your heart that God has raised Him from the dead, you will be saved (Rom 10.4–9). “See, I have set before you today life and good, death and evil, in that I command you today to love the Lord your God…and the Lord your God will bless you…I call heaven and earth as witnesses today against you, that I have set before you life and death, blessing and cursing; therefore choose life, that both you and your descendants may live; that you may love the Lord your God, that you may obey His voice, and that you may cling to Him, for He is your life and the length of your days…” (Deu 30.15–20). Those words could have been, and truly they are, spoken to us, for they have as much application to us as those words did to them. The Lord tells us to learn from Israel. May we learn that the Lord says what He means, and means what He says. The Lord blessed them when they obeyed Him, and the Lord cursed them when they disobeyed Him. Who is the Lord? Jesus is Lord. Also, the Bible says of Him, “Jesus Christ is the same yesterday, today, and forever” (Heb 13.8). Therefore, what Jesus said to the Israelites in Deuteronomy 27–30, He also says to us in the church! Therefore, He will bless us when we obey Him, and He will curse us when we disobey Him. Yet, we know that even as He wanted the Israelites to return to Him, so He wants us to return to Him when we sin, or when we fall away completely, and when we do, He receives us with loving acceptance. I do not know of a greater way to experience inner peace. Therefore, do not be discouraged, but follow the Lord with all your heart, and He will lead you with all His heart. The world will hate you, but if you know He loves you, that is all that matters, and you shall die in peace. This entry was posted in Deuteronomy, Misconceptions about the OT, NT Use of the OT and tagged Bible, Deuteronomy, Deuteronomy 27-30, Don Ruhl, God, Israel, Jesus, Lord, Lord Jesus, Moses, Mount Ebal, Mount Gerizim, Old Testament, The Covenant with God. Bookmark the permalink.